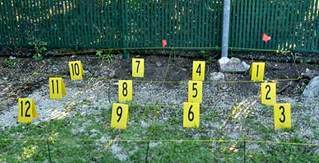 Layout of crime scene in yard where bones were found. When a woman digging in her yard on the Florida Keys last fall turned up a jawbone and part of a human skull, detectives immediately could tell the bones had been there a while — “possibly as long as 75 years,” the sheriff’s office said at the time. Now the Monroe County Medical Examiner’s office says the results of radiocarbon dating tests are in and the bones are much older — about 2,400 years — placing them in the time period of 200-440 B.C. via Human Bones Found in Florida Yard Date Back 2,400 Years. This entry was posted in Culture, Florida - History, Florida -- General, Paleontology, Science and tagged Anthropology, Culture, Florida - Archaeology, Florida - History, Florida -- General, old bones in keys, Paleontology, Science, The Other Florida on March 5, 2011 by Bill.